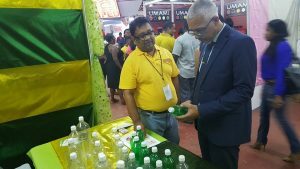 Minister of Business, Dominic Gaskin examining a product at Uncapped, an expo for small and medium-sized agro-processors, at the Sophia Exhibition Centre. Minister of Business, Dominic Gaskin has called on Guyana’s private sector to stop expressing disappointment about political instability and instead portray themselves as a neutral organisation, almost immediately after the Guyana Manufacturing and Services Association (GMSA) Friday night called for political will in improving the agriculture sector. Addressing the opening of the GMSA-organised agro-business expo, Uncapped, being held at the Sophia Exhibition Centre, that business organisation called for political stability as that is a key ingredient in attracting sucessful investment. His comment came against the background of widespread outcry against President David Granger’s unilateral appointment of Retired Justice James Patterson as Chairman of the Guyana Elections Commission (GECOM). “Within the last week, there has been rise in the political temperature at a time when the economy is slowing down. The GMSA is concerned about the impact this political uncertainty and fallout could have on our businesses and the wider economy – it does not send the right signals to the private sector and investors – both local and foreign,” he said. However, the Minister of Business expressed concern that in Guyana political fall-out is used as means of attacking the country’s economy, unlike other nations where business activity continues despite deep political divisions and “the most poisonous of political climates”. He called on the private sector not take political sides or become too distracted by the estimated 60 year-old political bickering even though it is undesirable. “We cannot let it dominate us to the extent that we allow it to infect our private sector and to affect business confidence so our private sector needs to be apolitical and needs to enjoy the support of the government of the day and our government is here to give support to the private sector,” he said. 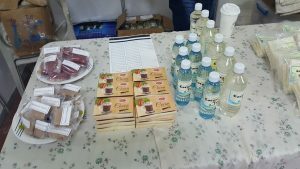 The Private Sector Commission, Upper Corentyne Chamber of Commerce and Industry, Georgetown Chamber of Commerce and Industry and the Guyana Manufacturing and Services Association are viewed in some quarters as being too cozy with the People’s Progressive Party Civic in and out of government. For his part, Prime Minister Moses Nagamootoo added that political disputes do not necessarily affect the business climate. “Whenever we have political fall-outs on any issue, it does not necessarily mean that there is instability and that it is injurious to business,” he said. He called on the private sector and government to “become bigger partners” because the State is the biggest investor on drainage and irrigation services, aerodromes and roads. The Minister of Business said he would like to see government and the private sector take advantage of existing trade accords such as the United States’ Caribbean Basin Trade Partnership Act, Brazil’s Partial Scope Agreement, Europe’s Economic Partnership Agreement, and the Dominican Republic through the Caribbean Free Trade Agreement as well as Caricom that could allow duty free access to almost one billion people. “That is a very big market and we need to start examining and strategising on how we can access those markets,” he said. Gaskin said Guyana needs to understand the standards, policies, market preferences and rules governing food imports by other countries such as the United States which recently passed the Food Safety Modernization Act. Other recommendations, he listed, are smart farming with newer farming technologies to increase yield with less chemicals and lower cost as well, understanding prices, getting more orders and earning more. 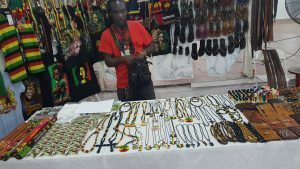 While Uncapped has attracted several agro-processing entities, other exhibits included garments, craft and the manufacturing of plastics and plastic bottles.